Still highly realistic, but the current View in 3D isn't what he looks like. Here's a screenshot posted by perculia. Incredibly realistic for a Mechanical Toucan, if it keeps the model shown in the 3D viewer. This little guy may be somehow tied to the Tanaan Jungle, or it could just be a recipe you learn from a trainer (boring!). Like your average IRL Toucan, his/her colour variance is confined mostly to his/her face/beak and chest areas. The pretty coloured wing tips are back! Gold now, instead of silver; this gold matches the breast colouration. These are the same mats and level currently required for Lifelike Mechanical Frostboar. Originally datamined with this model: here, in this post, which is now the model of the Axebeak Hatchling. 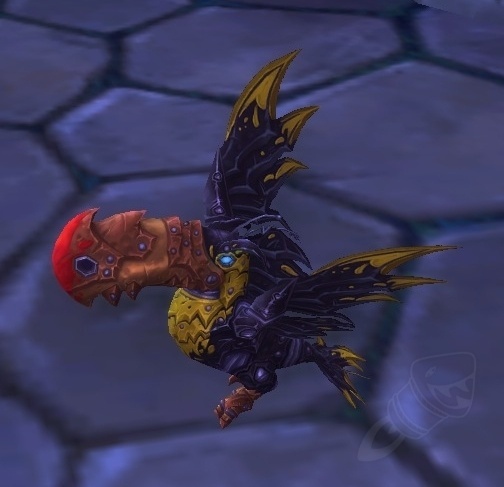 There's a 3D model tagged in the model viewer on this page, but I'm fairly certain a Mechanical Toucan won't end up looking like a Mechanical Pandaren Dragonling. How much paint does it take to color a Mechanical Axebeak? should be mechanical. not flying.